Big, glossy and expensive media campaigns that seem to spring out of nowhere make me slightly defensive and wary. They make me wonder if they are real or something dreamed up in a plush office somewhere by individuals or a group of individuals who want to up their profile, change the public perception of them or are just publicity hungry for one reason or another. I am naturally suspicious of campaigns that seem to emanate from the wealthy elite who seem to be happy to give the rest of us the benefit of their gold plated wisdom. The latest such campaign is the ‘Ban Bossy’ one. Apparently girls who are natural leaders and organisers are often called bossy... yep, I thought, I’ve been there and done that. But apparently that is not a good thing. Girls who are told they’re bossy can feel unlike and unpopular and as a result calling girls bossy can result in them not putting themselves forward to take these leadership roles. My first reaction was – what a load of old nonsense. I have been called bossy since I could talk and I have always taken pride in that fact. I took bossy to be a bit of a back handed compliment. Have I been wrong all these years? When I was thinking about all this before putting pen to paper, one fact leapt out at me. Like me, they have all gone to all girl schools. Is the problem here that it is boys that are uncomfortable with girls being leaders? Is it the boys who seem to have this power to make bossy a bad word and make the girls feel ‘unlikeable’? This would chime with my experience. My bossiness (or assertiveness as I generally call it now that I am grown up) has occasionally caused problems with male bosses! Oh – and are we going to change the name Boss while we are at it? Or can men be bosses but girls not be bossy? Sorry I am totally lost with the logic of that. I am very unconvinced by this campaign. I think it risks being misinterpreted by our girls; teaching them not to be bossy but to be leaders. Instead of trying to ‘Ban Bossy’ why not ‘Own Bossy’? Be bossy and be proud, because when our ‘bossy’ girls get out into the big world of work will be called all kinds of other not flattering names. Let me see – ‘over-bearing’, ‘shrill’, ‘bloody feminist’, ‘trouble-maker’ – oh the list is endless. I’ve been called them all. I have also been told that I wouldn’t succeed unless I toned myself down. While I admit that my success is questionable I have no intention of toning down. Hell no. Once again are we accepting men’s view of things? Who say’s bossy is bad. Beyonce, one of the campaign’s figureheads, says “I am not bossy, I am the Boss.” That sounds more like the attitude I want our girls to have. So I will continue to tell me girls – be bossy and own it. Bossy means that you are willing to give leadership. Oh and I also tell them that if they are going to live their lives trying to be liked by all and sundry they are on a hiding to nothing. Be kind, treat people like you would like to be treated... but all groups need a bossy boots. So grab them boots... wear ‘em, own ‘em. And feck the begrudgers. 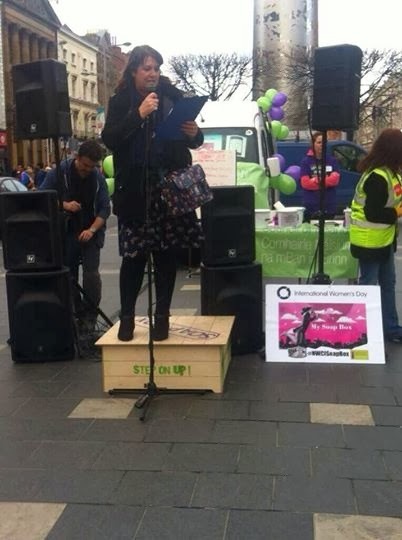 International Women's Day and I was invited by the National Women's Council of Ireland to take part in their SOAPBOX event which took place in the middle of O Connell Street - just opposite the GPO. A place famous for oration... some more glorious than others. It's also around the corner from some of Dublin's most formidable women - the fruit sellers and traders of Moore Street, whose powers of making themselves heard over the din of the city is legendary. I didn't sell any bananas but I was honoured to take my few minutes on the soapbox. Here is the text of what I roared! It certainly is time that this world of man’s design fell apart. It certainly is time for women to demand much more than just equality with men. It is time for us to demand a new world; a world in which we can participate fully and as equals but a world which acknowledges that we are not men; a world where we can express our womanhood without fear that it will be perceived as weakness. All women are heroes in my opinion. We bleed every month which can often make us feel like crap but we carry on with our jobs, paid and unpaid, pretending all is fine as we pop another nurofen and dream of reaching home where we can fling ourselves on the sofa with a hot water bottle and a bar of chocolate. I know menopausal women who suffer horrendous periods which are challenging in a practical as well as physical way – and they carry on working wearing black a lot and praying a lot that their super plus extra sanitary protection doesn’t let them down. Would men be so silent if roles were reversed? Would they hell? How many women are afraid to display photos of their kids on their desks in case it gives the game away. How many women miss their new baby so much when they return to work after maternity leave that it causes physical pain? How many women wish they could take a couple of years of reduced hour working in order not to miss their children’s early years? How many women hate that their children are in crèche from too early in the morning till too late in the evening? And why do so few women articulate these feelings openly? I know some men feel all these emotions too.. but today is about women. How come we live in a modern and relatively wealthy country where we have unsafe maternity services and where we have so little choice in those services? And how come we are not raising a holy racket about it? But most of all how come we live in a country where the work of caring is so undervalued. Our children are our most precious asset – both individually and nationally. So how is it that the people who care for them are in general working for a minimum wage? And of course this is equally true for those working in nursing homes – caring for our most vulnerable elderly. Care, that most traditional of women’s work, should not be left to either charities or the private sector. Caring should be heavily subsidised by Government in the same way education is and should be run by professionals on a not for profit basis. Michael Harding spoke of women’s voices. And yet the day after his beautiful column appeared in the Irish Times, we heard that 1 in 3 women in the EU have suffered physical or sexual abuse. The figure is 1 in 4 in Ireland. That means women in our neighbourhoods, perhaps in our families, in our circle of friends have or perhaps still are, experiencing violence. And yet they are largely silent. There still exists a shame and stigma to admitting that our vulnerability, that which is part of being a woman has been cruelly and viciously exploited. We are 51% of the population and here we are marking an International Womens Day at an event organised by the National Women’s Council of Ireland. I hope that some day our grand daughters and great grand daughters can laugh at the madness of such a concept. Michael Harding finished by saying that “women have been my compass, my anchor, the ground and the completness of my universe. As I grow older they are the warp and weft of all my spiritual hope, because it was women’s eyes that saw Christ resurrected and it was women’s voices who sang the song of it – until they were silenced. It is time to break our silence. It is time for us to sing our songs, to tell our stories, to support each other and demand the changes we need to fulfil our destiny to change the world. Our men need us as women and our grand daughters are depending on us. Aren’t The Oscars just gas all the same? I watched the ‘Live on the Red Carpet’ last night until my head was literally melting from the vacuous conversation which went round and round and round. The presenters all sing their questions, in voices that all go up at the end of the sentence. “How are YOU?” And most of the questions began with ‘so’. A drawn out so. “Soooo, who are you WEARING?” Gas but grand for very late at night. I had dreams of floating about in a sea of nicety and designer gowns and sparkling jewels... and pizza? They ate pizza? In the theatre? What? Anyway each year at this time we hear, once again about how there are so few meaty roles for women. Cate Blanchette, winner of Best Female Actress in a Lead Role referenced it in her acceptance speech. She stated that films where women are the centre are not niche. They are movies people want to see and they make money. Now I am not much of a movie buff. And probably one of the reasons that I seldom go to see films is that so few interest me. What interests me, in life, in books and in movies are the stories of people’s lives; ordinary people who may lead extraordinary lives or do extraordinary things or just ordinary people’s ordinary lives. And in particular I love to hear the stories of other women’s lives – real or imagined. It is this fascination with women’s lives that drives my radio show, The Hen House on Dublin South FM. So Cate’s comments got me thinking about my favourite movies ever and guess what? Yep, they were all movies about women’s lives. So – for your delectation may I present my list of some of the very best movies.... ever! A bit shmaltzy but wonderful cast led by Shirley McLaine and Julia Roberts. Based on the wonderful book by Fannie Flagg... a tale of intergenerational women’s friendship. A treat. Ultimate girl power, Brad Pitt as a young fella and the best ending ever. Powerful and moving tale from the 60s in the American deep south. Bette Midler and Barbara Hersey combine to bring this wonderful tale of female friendship through the decades. I cried for weeks when I first saw this movie. Wonderful comedy about an unplanned teenage pregnancy, poignant and clever. I didn’t watch this when it was first released – you may be surprised to know.. But this is a charming movie. Maggie Smith plays a revolutionary teacher in an all girls school. It’s like Mallory Towers for grownups. Worth a watch. If you don’t know what Mallory Towers is – ask your Ma. I will never tire of watching Pauline Collins play every woman I have ever known... and who doesn’t dream of how life could be way more fulfilling if you lived in the sun, near a beach. Sublime, magical and with added Johnny Depp playing an Irish gypsy. Is this my favourite.... maybe. So gather your girlfriends and grab some wine and fall into one of these beautiful movies. I will be taking part in theNational Women’s Council Soap Box Event... come along if you are in Dublin City.